This Father’s Day, consider giving a father-son gift: a novel that fathers and sons can enjoy together. Full Cycle by Christopher Blunt is just such a book. 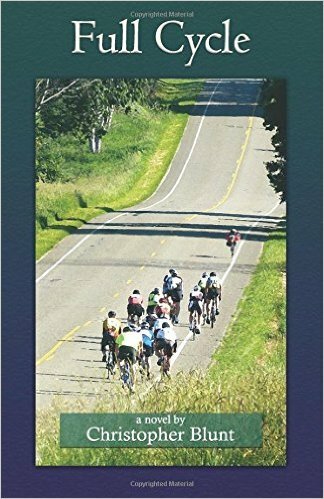 Perfect for readers age 10 and up, this father-son story follows sixth-grader Alex Peterson, a wanna-be athlete hindered from achieving this goal by an injury he received in an accident at his own birthday party. No good at running, he can’t excel in baseball like his younger brother; he’s the last one picked for the team in gym class and very self-conscious about his physical limitations. Alex buries himself in his music and, asked to compose a score for a promotional video for a local bicycle club, he wishes to accomplish what the riders have done: cycling more than 200 miles in a single day, from Seattle to Portland. Then he finds out that his father actually participated in one of those bicycle trips–and he’s hooked. He wants to train for the ride, and he wants his father to go with him. Full Cycle is a story of perseverance, of teamwork and of looking beyond a disability to draw upon talents yet untapped. It would make a great movie. 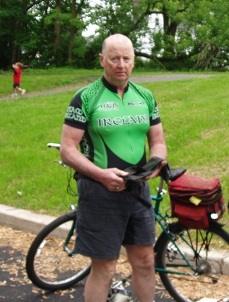 My dad on a bike trip with the Boy Scouts, circa 2008. The well-paced story will keep you reading far too late into the night, but isn’t that what summer vacation is for? The Fine Print: This post contains Amazon affiliate links. Your purchase through these links supports this website. Thanks! I received a review copy of this book from the author, and no other compensation, for the purpose of this review. Opinions expressed here are mine alone. Find me at CatholicMom: my dream job! Check out my latest favorite books and other things at my Amazon page! Purchase your copy through my Amazon affiliate link! Most high, all-glorious, good God, bring light to the darkness of my heart. Your holy and true will. Why are Catholic Women “Mean Girls” on Social Media? Barb Szyszkiewicz is a participant in the Amazon Services LLC Associates Program, an affiliate advertising program designed to provide a means for sites to earn advertising fees by advertising and linking to Amazon.com. Opinions expressed here are mine alone. Quote unto others as you would have them quote unto you: do the right thing and link back! Leave it better than you found it.